In our latest Event Spotlight, we speak to select members of the committee [Estelle York, Mad Alex and Nick Wright] behind the Black Rose Ball, to talk about the health of goth culture in the UK, the importance of their event alongside the work of the Sophie Lancaster Foundation and more. S] Talk us through the background of the team, and your passion for Goth culture? Estelle] It all started in 2013 when two of our group decided that they really wanted to attend a high Goth, elegant, masquerade ball. However, they couldn’t find the sort of event they were after in the UK and decided to start their own. The masquerade ball has always been the centre piece of our weekend, held in a beautiful venue in the gorgeous and historic City of York. Joined by both like-minded people and open to all those who love dark Gothic events. The other two central aims for all our events are to create safe spaces for the alternative Gothic community that are open to all who feel different – and to raise funds for charity. In the first two years we raised funds for a local hospice, that does excellent work, but in the last four years, we decided to raise for the Sophie Lancaster Foundation as it is a charity close to all our hearts in the alternative scene. Our committee members are a hard working small team of Goths but we are open to all alternative people who want to give us a hand creating memorable Gothic events. Alex] The idea for The Black Rose Ball was a joint one between Estelle and myself. We independently went into the ballroom in The De Grey Rooms during tours of the Theatre Royal next door over the 2013 York Resident’s Weekend, it having been recently taken over by the theatre and become available for hire again after many years. We discovered afterwards that we had both had the same thought: “Wouldn’t it be great to use this space for a Goth night? !” So we joined forces and began recruiting friends and local DJs to help. Estelle’s partner worked for a local charity at the time, St. Leonard’s Hospice, and was looking for ideas for fundraising ideas, so he suggested that we make it a charity ball. That fitted perfectly with our aims and I had some experience with running charity events, having helped my mum out at fundraising events for the charity she was involved with, Friends of Dorset’s Archives, when I was growing up. I also knew that the venue had been used for a Goth night, Afterlife, many years previously (I had heard people talking about it when I first starting going to The Body Electric) so I felt that it could work, despite misgivings about the high costs involved. To our surprise it did! Nick] Well, we are all Goths so the passion is there already. 35 years this phase has lasted for me so it is my life-some days I outwardly show my Goth credentials by just wearing t-shirt and jeans, other days Edwardian frock coats , I’m still recognised as a Goth even in my work clothes. S] Talk us through the challenges you have faced this year? E] Similar challenges that all gothic events face really – perhaps with the added element of not being in a major city with a large Gothic community. N] There just seems a reticence from anyone to attend events be that due to the current economic climate or Goths generally getting older so having to factor in both health and child care issues. People who would once have travelled the length and breadth of the country for an event now select events more on the grounds of “will we be able to sleep in our own bed tonight“. And of course there is still that admittedly small element of the general public that look for conflict with our subculture which is why the work of the Sophie Lancaster Foundation is so important. S] What do you think of the Goth culture scene in Yorkshire, and the UK? E] The scene in Yorkshire is in great health. Great things are going on in Leeds with Carpe Noctum and Goth City, for example, but also in Whitby with Gothtown and Absinthe Productions. Obviously lots of festivals here in the North as well, for example with Infest. We are also very lucky in York to have excellent train connections – so it’s easy to hop on the train to go to Manchester, Sheffield, London or wherever you want to go to see any gigs or attend events. The great train connections also make it easy for our attendees to travel to the Black Rose Ball Weekend. A] In many ways, the UK Goth scene is still in good health overall, with plenty of events to go to and indeed the inevitable clashes occurring fairly frequently, despite promoters’ best efforts. Unfortunately that success is a little patchy at the moment, with some areas of the country in decline while others are thriving. We are proud that the Yorkshire scene is one of the areas where things are thriving, despite problems on the coast being in the news at the moment. The main problem with the UK scene is one of sustainability; the numbers of younger people coming into the scene are very low in many places. We feel that a degree of musical stagnation in some places is not helping this and are of the opinion that it is important that new music be played at club nights, in addition to old favourites, and that upcoming bands, and those established abroad but less known in the UK, be given a chance as well as well-known acts, to keep the scene fresh. We are very pleased that many in Yorkshire seem to agree, with many forward looking events in the county. S] Who are the bands on your radar; including and aside from the band’s you’ve booked? E] There are so many great up and coming bands at the moment. We are especially excited when we can bring over bands from Europe, who then go on to play in Whitby, for example Saigon Blue Rain. We were also really pleased to put on Sometime the Wolf, who will now be playing in Whitby in October in the same line up as Fields of Nephilim. Our committee has a wide variety of different band tastes, so we try and put on as many as we can. As we have a theme each year, we also try and match bands to this. We are currently planning our 2019 ball weekend, around the theme of ‘Cabaret Macabre’ and should have some exciting news on bands soon for that. N] The problem with championing any band is twofold. Firstly, a lot of new music is heard at club nights and you can’t always find out who played that brilliant track. Secondly, I have a history of bigging bands up either just before they have a radical change in direction or implode spectacularly. I’m happy to see that one of the Bands we put on at our recent all dayer have secured a slot at the new Whitby festival. A] Some bands currently on my list to purchase CDs by / see live / book in the future, in no particular order: UnderTheSkin, Strvngers, Ash Code, M.I.N.E., Auger and The Glass House Museum. I’m sure there are more but those come to mind right now! S] Talk us through how your values and those of Sophie Lancaster combine? E] We’ve always wanted to ensure that our events are a great experience – but also one where all alternative people feel comfortable. Although most of our attendees are Goths, not all of them are. Alternative people still experience discrimination in various situations in life and the ball weekend is an opportunity to just be who you are and dress to the nines; surrounded by like minded people. The work of S.O.P.H.I.E is so important as it helps to reduce prejudice and to increase tolerance amongst us all – which are aims that we hope all our events also strive toward. N] Our main objective is to support and raise money for The Sophie Lancaster Foundation. So we have to look at being welcoming of all, ensuring everyone can and do feel comfortable and unthreatened at our events we have to sing off the same hymn sheet, as our core values must be the same. A] The values of tolerance and inclusion are commonly held across the Gothic scene. To me, the Goth scene feels like a massive worldwide extended family; I have so many wonderful friends around the country and indeed the world who I have met through the scene over the years and have bonded with over the music. One of the things I love about going to the large German festivals is the variety of people one meets, from all four corners of the planet, and it is a joy to see everybody getting along so well together regardless of cultural differences etc. We feel that the aim of The Sophie Lancaster Foundation to teach these values more widely is very worthwhile, as the rest of society can only benefit by discovering the joys of feeling at one with diverse groups of people. S] What are your plans for the future of the brand? E] We are growing slowly and organically. 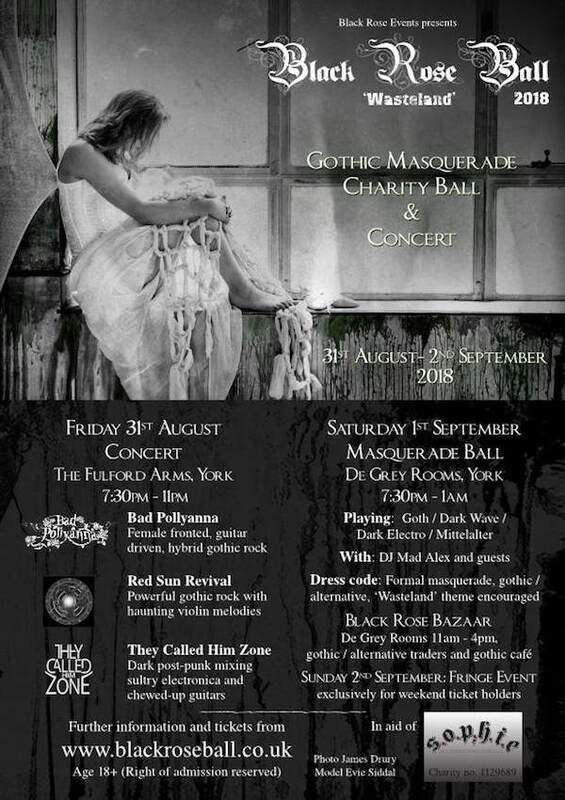 As Black Rose Events, we plan to put on more gothic events in York throughout the year, including more regular club nights. For the Black Rose Ball itself, we hope to grow in to an event on a similar scale as larger gothic balls in Europe. We are hoping to recruit more volunteers to the committee, so that we can put on a greater variety of events. The Black Rose Ball is now a known event in the North of the UK but we want to strive for greater name recognition and to attract suitable sponsors who will enable us to grow further in quality and quantity of our events. N] Evolve, mutate and improve – I’d like to keep our core audience and build upon it. I want our event to be mentioned in the same breath as the big European festivals. S] How has your mission statement changed over the years? E] To be honest, we don’t have a formal mission statement as such. Our aim, as mentioned, is to create a variety of gothic events throughout the year and to raise funds for the Sophie Lancaster Foundation. The centre piece and highlight will always be the elegant Black Rose Ball, which takes place on the first weekend in September every year. N] When we were just a ball we didn’t have to consider anyone but ourselves now with both traders and performers involved we have to be mindful that these people also reflect the core values of S.O.P.H.I.E. 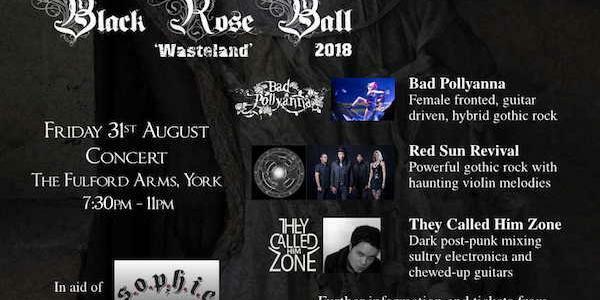 Roz] Tickets and further information for this year’s Black Rose Bazaar, The Black Rose Ball Concert and ‘Wasteland’ themed Black Rose Masquerade Ball can be found on our website at www.blackroseball.co.uk Or, via our Facebook Pages: Black Rose Events or Black Rose Ball 2018-‘Wasteland’ We look forward to welcoming you!